How to Control Water Table Fluctuation beneath Foundation? Dear reader we have discussed about water table fluctuation and its detrimental effects on foundation performance. Here we like to discuss about control of water table fluctuation. We have discussed a post relevant to this topic regarding controlling expansive potential of expansive soil like black cotton soil. Here we will discuss about sump pump. The fluctuation problems can generally be solved providing some types of barrier to control accumulation around water building boundary. We know that rise in water table generates hydrostatic pressure which produce uplift below basement or foundation. Providing a barrier against water accumulation is difficult or costly, as we discuss in “cutoff wall for mitigating foundation problem for expansive soil”; and we generally provide any form of drainage system that collect water to remove them from building site up to a safe distance. In residential building and in some large building, drains are applied covering the perimeter of basement in regular pattern. In some cases, sloping basements are provided covered with granular materials which are provided such that a horizontal surface I achieved to provide a serviceable basement. 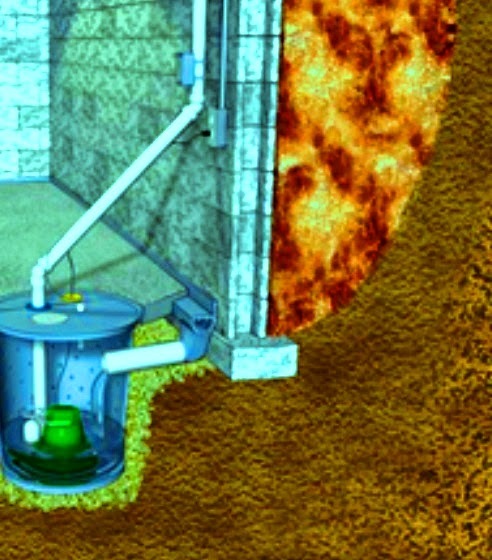 In such basement, a well is provided at the lowest point and have pumping facility. The well is called sump pit and the system is called sump-pump system. Now-a-days there have many pumps that can operate automatically when water level rise up to a critical level, obviously, in sump pit. Now question is where to discharge this water? Usually municipalities in many regions, do not permit such water to discharge to sanitary sewers. Water table can be lowered permanently, but when concern to environment, it is not permitted.